MK Moallem accuses businessmen attending World Economic Forum of trying to scare Israelis with false warnings of boycott woes. MK Shuli Moallem-Refaeli (Jewish Home) on Monday sharply criticized the pressure to make territorial concessions reportedly being exerted by top Israeli businessmen, as they are set to attend the annual World Economic Forum in picturesque Davos, Switzerland. On Monday, Yediot Aharonoth reported that the group of roughly 100 business leaders have told Prime Minister Binyamin Netanyahu "the world is running out of patience and the threat of sanctions is rising. We must reach an agreement with the Palestinians." The attendees are members of a group called Breaking the Impasse (BTI), which was founded in 2012. Members include top Israeli and Arab business leaders, including Israel's tycoons and captains of industry such as Ofra Strauss, chairwoman of the Strauss Group, businessman Rami Levy, Google Israel CEO Meir Brand, Amdocs co-founder Morris Kahn, and hi-tech entrepreneur Yossi Vardi. The group is set to meet international leaders on January 26 with Justice Minister Tzipi Livni, Palestinian Authority (PA) chief negotiator Saeb Erekat and US mediator Martin Indyk, to stress the necessity of peace and stability to economic development, reports i24news. Moallem attacked the group's claims that deals must be made to protect their financial interests, remarking "making the peace process subject to the pockets of citizens of the state of Israel is outrageous." The MK noted that the European boycotts, which recent reports indicate are being manipulated by US Secretary of State John Kerry to force Israeli concessions, should not be Israel's prime economic concern. "The illusion of peace and the boycott festival they're using to try and frighten us won't solve the problems of Michal, a single-parent mother from Petach Tikvah, or of Eviatar, a computer student who finished his master's degree and can't find work," charged Moallem. Moallem argued the business leaders' "concern" over the peace process was misplaced. "The middle class in the state of Israel is collapsing under the burden, and we don't hear the business leaders mention it." "Housing prices, cost of living, the elderly and Holocaust survivors," lists Muallem. "When did you concern yourselves with these issues that truly harm the pockets of citizens?" "Go to Davos and don't forget your ski suits, I'm concerned..." quipped the MK in a parting volley. 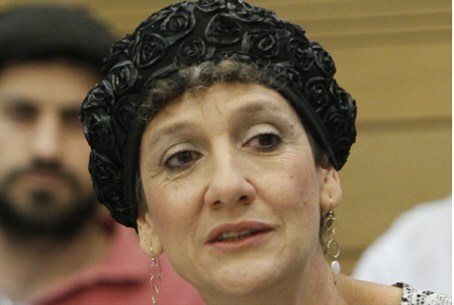 Moallem has in the past remarked that the eviction of Jews from Judea and Samaria is a "red line" for her, as she spoke in defense of Jewish Home's remaining in the coalition despite the release of terrorist murderers. She has also attacked claims that "price tag" vandalism constitutes "terrorism," as well as her party's collaboration with Yesh Atid.